In last week’s newsletter, I presented you with our congregational covenant in its entirety. This week, I’d like to start examining our covenant more carefully. Starting with the first line, we can really begin to get a sense of what it’s all about. When I taught kindergarten, I spent a WHOLE LOT of time teaching rules and behavioral expectations. The question I asked most was “what does that look like?” I’d then have my kinders act it out. (They really enjoyed acting out what it doesn’t look like, too!) Now of course I am not comparing you all to kindergarteners that are just learning what respectful behavior looks like. But being in a covenantal religion may be a new thing for many folks. 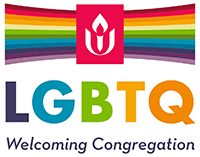 Unitarian Universalism has no theological creed that we expect our members to believe in order to be “one of us”. Instead, our faith provides us with principles and values that guide us in our promises of being together and living in a way that builds the Beloved Community — a community of justice, truth, and love. What we believe is that it matters how we behave when we are together. It matters as we enter into a covenant that helps us shape our future and creates possibilities that go beyond what we thought possible. Indeed, respect is a requirement, whether you agree with someone or not, whether you like the same things as others or not. If you look at our First UU Principle, you’ll see it there, too. Every person has inherent worth and dignity. Respect for all is challenging, I know. It can be hard to see the inherent worth and dignity in people who don’t share the same values as we do. That’s why we practice here in our smaller and safer community. Often I hear from people that they enjoy going to a UU church because they’ve found “like-minded” individuals. But we know that’s a superficial assumption. It’s also damaging to our community. We often have more differences than we do similarities and if we take a position of respect for people only because we think they think just like us, then we are taken aback when we realize how complex they really are. The respect then starts to fall away. Let’s make the valid assumption that we are all really different. Let’s respect each other because we know we are so different from one another and that means we have a lot to learn from each other! Let’s make respect a requirement so that when we encounter something unexpected or disagreeable from another person, we can open ourselves up to listening, learning, and remaining kind to one another. Kindness is a gift. It should look like we want to give it to one another because we truly respect each other, no matter what. Kindness is not given because we have to be kind. Kindness is not given out of selfishness because we want to make ourselves feel good. Kindness is given to benefit the other, and ultimately, our whole Beloved Community. It’s a challenge to practice respect and kindness here in our small community, but with patience we will begin to understand what it truly looks like. Then, we can continue to challenge ourselves by practicing it with others outside of our church walls, even with those we never thought possible.